Distant Horizons is an exhibition of vibrant gouache and pastel paintings that have been inspired by my recent journey to Bhutan, the tiny Himalayan 'Mountain Kingdom of the Thunder Dragon', Nepal, and Northern India. This is my fourth solo exhibition that I have participated in with Somerset Art Weeks during my ten years as a resident in Wincanton; I have exhibited in London, and worldwide for many years. My paintings will be on show during Somerset Art Weeks 2012, at my home, 2 The Old Police Station, North Street, Wincanton, BA9 9AZ, from Saturday 15th until Sunday 30th September 2012, 11.00 am - 6.00 pm, Thursday, Friday, Saturday and Sunday. Childhood dreams of distant places have become a reality through my passion for worldwide travel and painting, which is the very essence of my creative soul. I endeavour to paint in the morning after meditation when the mind is less cluttered, it is important for the mind to be as pure as possible. In my life spirituality and adventure have taken over the desire for material objects; I follow my intuition and dreams, and it is with this sense of inner peace and freedom that change happens. A year ago I was fortunate to embark upon a magical journey to Bhutan, a tiny Buddhist country nestling high up in the Himalayas, a wilderness of rugged, sharp peaks that are festooned with colourful prayer flags fluttering in the wind, and dramatic, fertile valleys. A land that time forgot, its history steeped in mythology, and a wealth of tradition that is kept alive today, despite being invaded by an army of modern technology. The Bhutanese capital Thimphu offers a sense of a cultural past and the present; ancient shrines and traditional wooden buildings intertwine with coffee bars and restaurants. 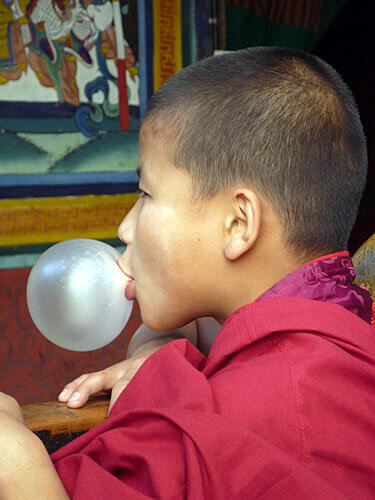 This juxtaposition of old and new is a quintessential part of Bhutan's charm; a crimson-robed monk can be seen with mobile phone pressed to his ear, chattering away happily, another young monk blowing a big bubble from pink gum. 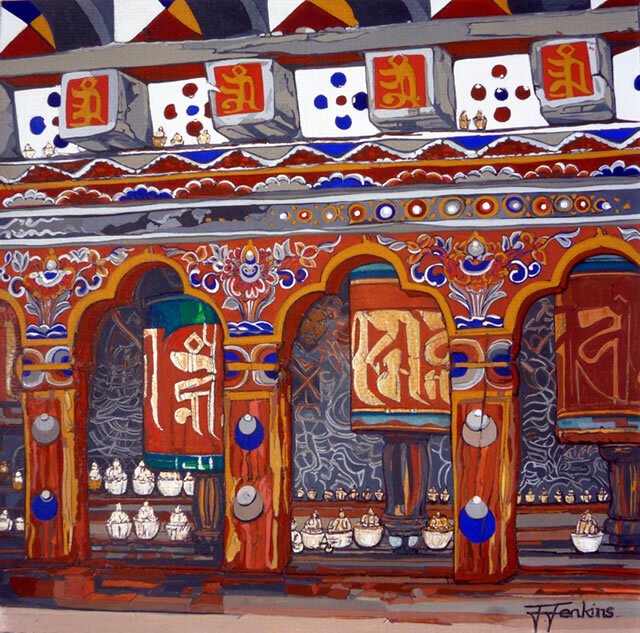 Bhutan is beautiful, colourful and exotic, featuring annual ancient Buddhist festivals. 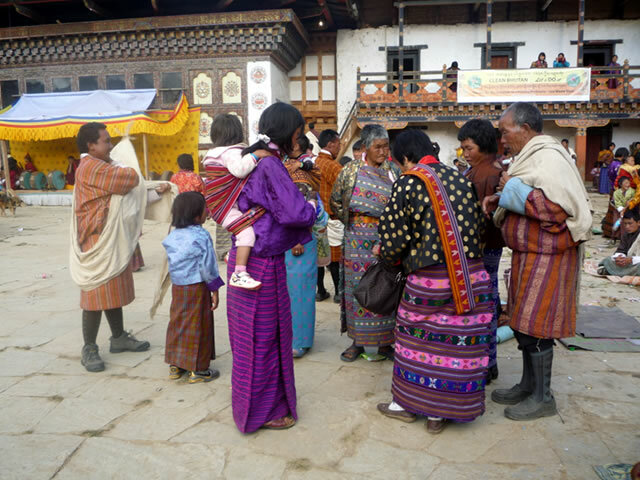 Thimphu tsechu festivities are spectacular, a family affair, with everyone sporting their very best traditional homespun attire. These spiritual and fun occasions feature dancing, singing, music with chanting of prayers accompanied by a cacophony of horns, an enchanting, magical display with all the colours of a rainbow. Natural earth colours embellish wooden architecture, temples, prayer wheels and religious artefacts, a kaleidoscope of warm red and yellow ochre, sienna and umber which mirror the richness of the land. I experienced a brief encounter with a Bhutanese Buddhist nun, an event that will remain with me for the rest of my life, a few delightful hours spent together with no English spoken, only the warmth of two kindred spirits sharing the gift of prayer and meditation. 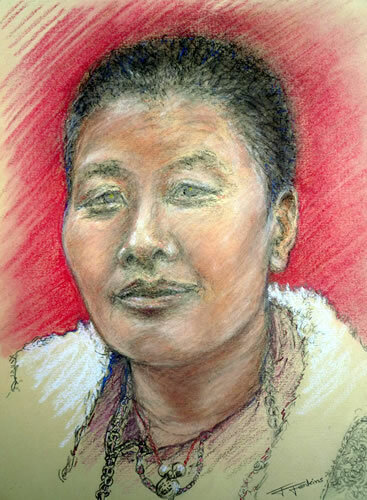 I have endeavoured to capture the inner beauty and serenity of this peaceful Buddhist woman in a pastel portrait. 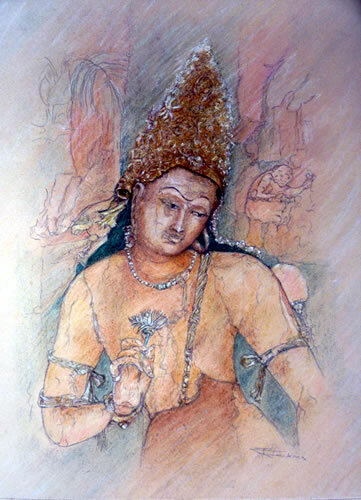 Travel to other fascinating and remote locations have influenced many paintings that are included in my exhibition, a 'Bodhisattva Padmapani', bearer of the lotus flower, and a figure of compassion with a gentle and peaceful demeanour. Framed prints and cards will be available for purchase. There will also be a SALE of paintings that have been created over the past few years.